You are here: Home / Marketing / SEO / What If Big Brands Spam Google’s Index? What If Big Brands Spam Google’s Index? How will Google handle brands spamming into it’s index or it is the case where brands will be allowed to spam Google’s index? Share your opinion. 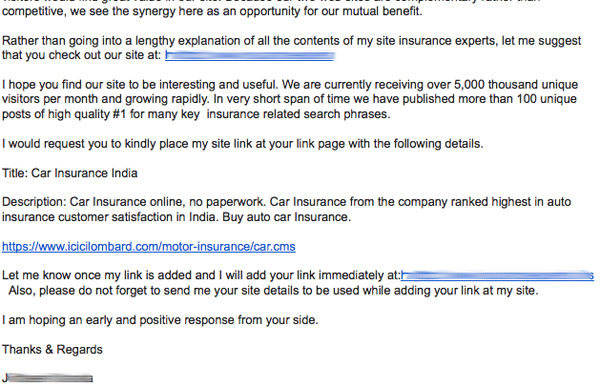 Got a 3-way link exchange email for my Technical Analysis Blog from some company doing SEO for ICICILombard. The mail read like this. I have removed identifiable information from the email because that is not the whole point of this post. ICICILombard is an insurance wing of the ICICI Group of companies and is a big Indian brand. 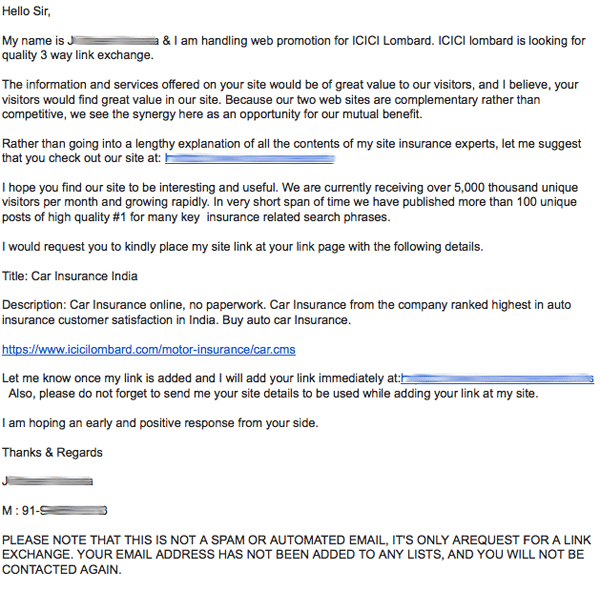 Companies like ICICI Lombard hiring such SEO experts for 3-way link exchange did not go down well with me and though I thought this to be a phishing email, I still visited the link in email to see what it offers. I saw it is that kind of a site where hundreds of those articles that they refer in email are all linking to the ICICILombard and has nothing more to offer. The Blog roll points to 4 other insurance sites (car insurance, health insurance, travel insurance…), which also are doing the same thing. Articles all point to ICICILombard. Classic case of Web Spam. How will Google handle brands spamming into its index or it is the case where brands will be allowed to spam Google’s index? Share your opinion in comments below. Getting backlink, via 3way is never treated as spam, matter is how quality website is? Hiring SEO people means you are always taking a big big risk and if you don’t care what your SEO people are doing, it can turn out to be a nightmare.